About Hotel: 6-Floors, 132-Rooms, Interior Corridors, High-Speed Internet, Indoor Pool, Fitness Center, Suites, mini refrigerator, microwave, coffee maker, Business Center, free breakfast, Cable TV (includes ESPN, HBO, CNN, WGD, and the Weather Channel), Coffee and tea maker, Hair dryer, Iron/ironing board, Radio/alarm clock, Telephone (local calls free), USA Today newspaper (Mon-Fri, complimentary), Work desk with lamp, 24-hour coffee, cookies and candy (complimentary), Airport shuttle (fee), Laundry facilities, Local shuttle (complimentary within six-mile radius), Parking (complimentary), Wake-up service, Whirlpool. Railroad View: Excellent View! Any room in the motel on an upper floor will give you a railroad view. Railroads past Hotel: Union Pacific, single track. 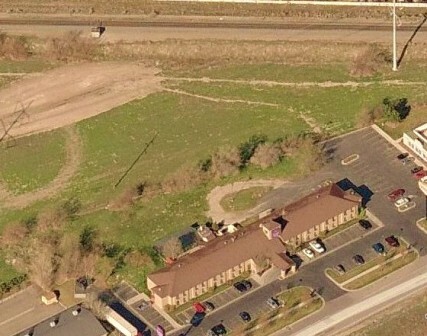 Photo Comment: The aerial photo shows the Country Inn motel located next to the single track railroad. There are trees along the parking lot, but those will not effect the view from the rooms, in addition the railroad is slightly elevated past the motel. Rooms on the front of the motel may have a slight advantage to view the railroad. Location/ Directions: I-15 to exit 293 Turn west on 10600 South St. Make the guided, legal U-turn at 400 West St. Hotel is on right along Frontage Rd. adjacent to I-15. 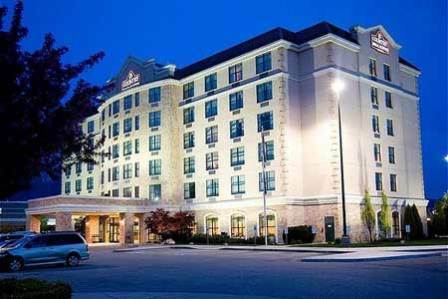 About Hotel: 2-Floors, 68-Rooms, Interior Corridors, Free wireless high-speed Internet access in all rooms, Free continental breakfast, Free local calls, Indoor heated pool and hot tub, Pet-friendly hotel (fee), Free Coffee, Guest Laundry, Outdoor Parking, Public Whirlpool/Hot Tub, Bus & Truck Parking, Cable/Satellite TV, Free Local Calls, Hair Dryer, In-Room Air Conditioning, In-Room Coffee Maker, In-Room Desk, Individual A/C & Heat, Iron & Ironing Board, Wake-Up Service. Railroad View: Fair View. Motel is near the railroad tracks, but trees around the property will prevent a good railroad view. Rooms on the rear of the motel are needed for a railroad view. 2nd floor rooms are preferred. 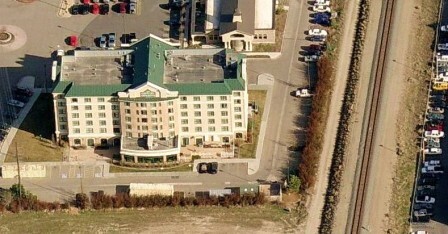 Photo Comment: The aerial picture shows the 2-story Sleep Inn motel. There are some trees behind the motel which will foul what would be a clear view of the railroad. The railroad can be seen at the top of the photo. Location/ Directions: I-15, exit 293. Proceed with a legal U-turn and take a right hand turn which is the Frontage Road to the Property. Free Parking, In-room coffee, voice mail, Iron & Ironing Board. Railroad View: Good View. Any room in the motel will give you a railroad view. 2nd & 3rd floor rooms will keep you above the parking lot. North side rooms will have an advantage! 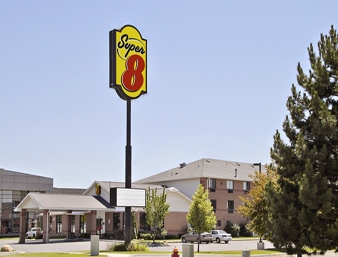 Photo Comment: The Super 8 motel is circled in yellow. The railroad can be seen to the left side of the photo. This photo looks northward. The rooms on the north side of the motel are the best to view the railroad.